This All American Selections Winner is the old-fashioned single and semi-double mix in shades of rose, pink and white. 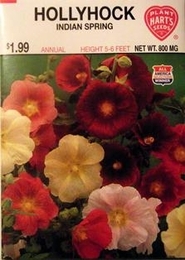 Hollyhock is a favorite in most gardens. Showy in beds or borders as well as meadow settings, they make excellent cut flowers as well. Hollyhocks are easy to grow but prefer a sunny, well drained location. Provide support if plants will be exposed to strong winds.